I had no idea. I mean, I knew that administrators put in long hours, working under a heavy stress load to ensure that good things are happening for kids. But truly, I had no comprehension of the level or type of stress that is inherent with juggling multiple projects simultaneously, dealing with a demanding Board while negotiating the daily hurdles of running a school. And truly, it’s been a juggling act since the moment we touched down in Jakarta fifteen days ago. Some background to set the stage: my husband (Greg) was offered a one-year interim Head of School (Superintendent) position in Jakarta, Indonesia. At the time his contract was signed, the school did not have a teaching position for me; we negotiated a four-day-per-week, unpaid internship working in the areas of curriculum, teacher professional development, accreditation and special projects. I will be working with the schools brand new Curriculum Coordinator in addition to being part of the Administrative team. In exchange, the school will sponsor my attendance at two professional conferences; The East Asian Regional Council of School (EARCOS) Administrators Conference held in Bangkok this October and The Association for the Advancement of International Education (AAIE) held in Boston, February 2014. The school that I will be working for has a twenty-year history in Jakarta, but has recently come under new ownership; a very large and influential property development company purchased the struggling school as their first foray into education. All businesses are motivated by profit, yet the owner of this company has a strong desire to leave a lasting legacy for the people of Jakarta and has chosen to do this through providing a world-class education for local and expatriate children. Decisions, while business oriented, are not driven by profit as the company realizes that a large investment is needed to bring the school to it’s fullest potential before any profit can be realized. This mind-set has done much for the betterment of the school as the budget is large and when unforeseen needs come up (we are looking to hire two ELL teachers for this coming school year) permission is quickly granted. My professional goals for this year are two-fold. First, I will complete my M. Ed. in Curriculum & Instruction (or Teacher Leadership) spring term 2014; this should be easily achieved, as my experiences will provide daily opportunities to augment the professional readings and writing I will be engaged in through my online SPU courses. However, my primary goal is to enrich my perspective and experience beyond the confines of the individual teacher’s classroom, and truly gain deep experience in the every day pattern of being a Curriculum Coordinator/Project Manager. I plan to capitalize on the rich set of experiences and unprecedented access to high-level meetings and negotiations that I will have this year, while developing my understanding of international school administration. Much of the work I have been engaged in the past two weeks is setting-up the very basic framework of a school; courses to be taught, time schedule and assigning teacher’s teaching schedule. These are all things that should have been completed by the former Head of School but were not. It is apparent from the schedule last year and complaints of former teachers that there was a lack of emphasis placed on core academic subjects. This is an example of the secondary schedule from 2012; precedence was given to the arts while core subjects (math, science, english language arts, and social studies) were somewhat neglected. With a student population comprised of 40% Indonesian, 37% Korean and the rest a mix of nationalities, focus must be shifted to English language acquisition across the curriculum. Indeed, an initial Measure of Academic Progress (MAP) assessment last year highlighted a crucial need for ELL instruction as 50% of the students were identified as having below-standard English skills. 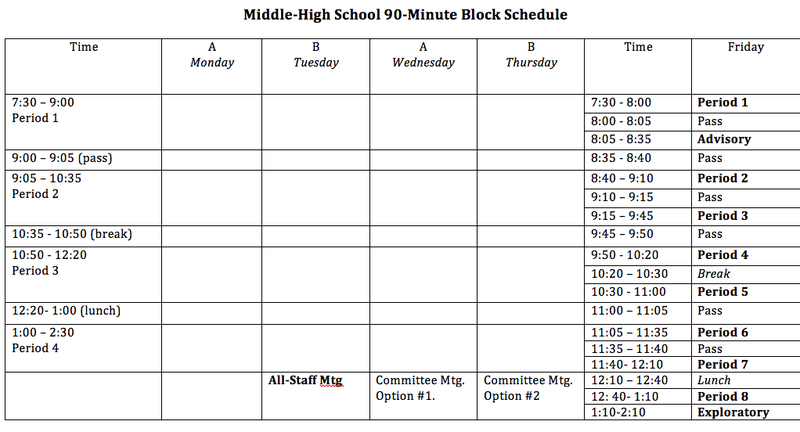 After many iterations and much contemplation about how to best serve our students ELL needs while building a rigorous college preparatory school while giving important scheduling time to Indonesian language and culture (we must keep the Ministry of Education happy) we decided on a 90-minute, eight period A/B schedule with a modified Friday timetable. We were able to keep the tradition of “houses” alive on Fridays and the tradition of providing Exploratory classes. This is an example of our new schedule that I helped to create. We are currently looking to hire a full-time ELL teacher and full-time ELL/Middle school English language arts teacher for this coming year. Again, these are crucial components of a school program that should have been taken care of by the previous administration but were not. 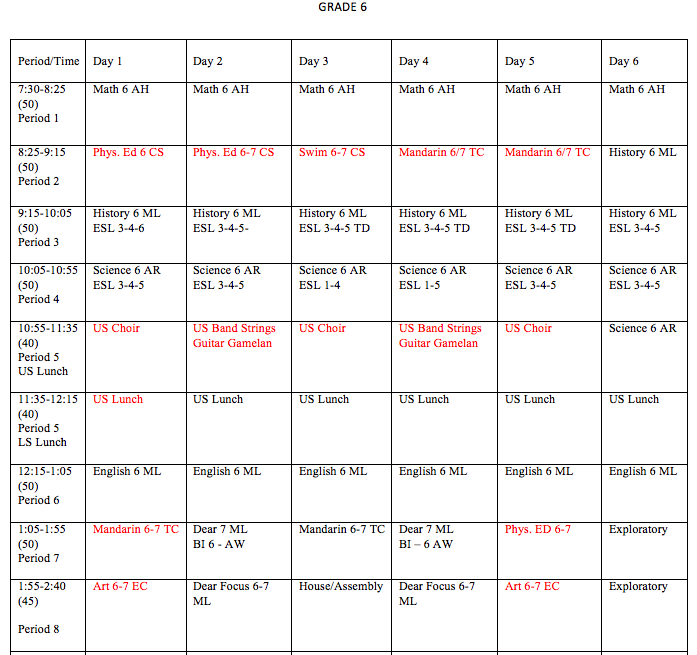 I have also been working with a teacher from last year to create our middle-high course schedule, actually timetabling teachers based on their CV’s and qualifications, as approved by the Head of School. This is a link to our working document MS_HS Schedule Semester I; I know this will change as teachers arrived and we have a better idea of possible electives they could teach but at least it’s a start. We based our required courses on the Office of Superintendent of Public Instruction (OSPI) recommendations for entrance to a top-tier four-year university. I have also created a course syllabus model for teachers; they will be required to submit a course syllabus for each of their classes. I will be looking through the school’s policy manual to determine if there is a school-wide policy related to academic honesty and grading policy. Updating the policy manual, teacher and student handbooks are on our immediate things to do list as they read like a narrative at this point, not policies and guidelines that are legally binding. I spoke with our new curriculum coordinator briefly about the need to create a school-wide policy/philosophy of grading that is reflective of standards-based assessment. 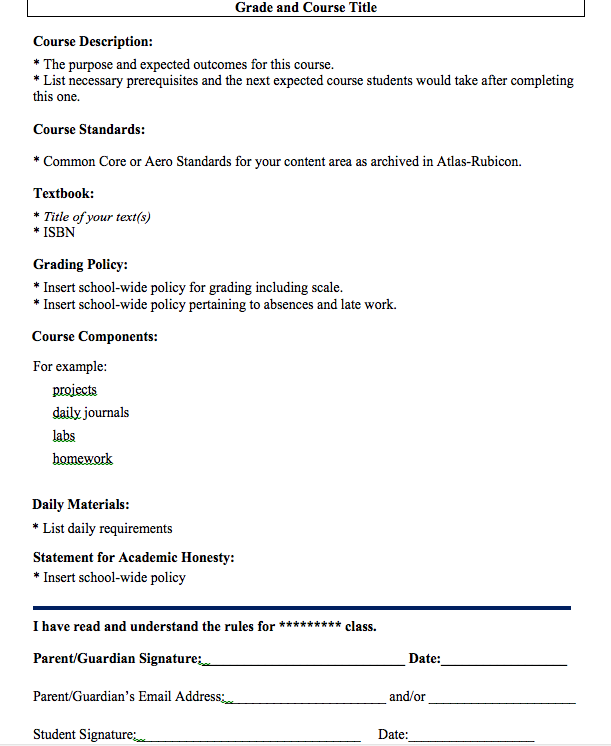 This is an example of the initial course syllabus template I created. We will also be signing-up secondary students for their classes the first day of school; again, this is a task that should have been completed before the end of last school year but was not. We will also be working with teachers on professional development in the areas of curriculum mapping using Atlas Rubicon and Understanding by Design (UbD) to develop units based on summative assessment that reflects standards. In two weeks, I will meet online with a representative from Rediker to receiving training in their computer scheduling module. This is an example of an A/B schedule semester 1 for Grade 6 students; their only elective choice will be either a performing or visual art and a choice between taking Mandarin or Indonesian. As I write this initial entry, 17 new teachers have arrived for their first introduction to the school, their new Head of School and myself. It is always interesting to meet new staff as the Head of School’s spouse; typically, I am working as a teacher and am quickly able to find my comfortable niche within the predictable and safe confines of my classroom. The local staff is incredibly friendly, welcoming and helpful while teachers may or may not choose to engage. I am accustomed to the inevitable invisible divide between myself and teachers and typically find friends amongst the Administrative staff. However, this experience is proving to be quite unique as my role has been explained as working with the curriculum coordinator on curriculum and MAP testing as well as special projects; it will be interesting to define my role in a way that teachers will understand that I am working in a professional capacity based on my own merit as an educator, not simply because I am the Head of School’s wife. I find it interesting to notice how differently I am approached by the new teachers; some have been friendly, engaging and are so excited to be here. Others have began their first conversation (with me) with a complaint or two and demands for things I could not possible influence (they want a sim card, the schedule for today is too long, their apartment is too small); taking on a role where I am. Finally, not only have we stepped into a situation where we are new yet expected to lead, we are expected to know the answer to all sorts of questions regarding promises by the former head of school that we are still discovering. To complicate matters further, the teacher turn-over was so high last year that 17 out of 23 teachers is brand-new; it’s up to us to build a positive and engaging culture. To sum up my experience so far, I can say that I am truly engaged in rebuilding an international school from the ground to become what we envision to be a college preparatory school. My internship has engaged me in meetings dealing with what an appropriate overseas hire package should entail to being present during a presentation to the Board of one of the most successful and wealthy companies in Indonesia. I am tired. Tired to the bone, but I am also exhilarated at the opportunities to learn that I never imagined. I understand the excitement and stress that comes with building something brand new, I’ve had a glimpse as to what it will be like to manage a group of educators that are jet-lagged, somewhat disoriented and have needs that to them are the most important thing at that particular moment, and I know what it is to lie awake at night as my brain processes that day and the day to come, wondering what I’ve missed and if my best will be good enough. My perspective has already widened as I gain elevation in terms of experience and access, affording me to look down on a school from above; I am beginning to discern the layers upon layers of intricate pieces that all play a part in creating an educational institution. I believe my metamorphosis from classroom teacher to program director/administrator has begun. This entry was posted in Leadership in Applied Curriculum, Standard 01. Instructional Planning, Standard 03. Curriculum, Standard 09. Cultural Sensitivity and tagged Administration, cultural competency, Curriculum and Instruction, Internship. Bookmark the permalink.